Lesson focus: Through the book of Psalms and the worship of the people of Israel, we get a glimpse into the character of God and how we should rightly respond to Him in worship. In Psalm 100, we’re reminded of God’s goodness and what it means to be one of ‘God’s sheep.’ Through the discussion of this Psalm you’ll have an opportunity to talk of the goodness of God in rescuing His people from sin through Jesus’ death in our place. Intro– – Play a round of “Name The Song”. Divide the kids into 2 teams. Explain to the kids in the group that you’ll read off one line of a song and they should raise their hand and say (or sing) the next line if they know it. Keep score of which team knows more songs. A few song lines and the following lines are included below. Fell free to add others that you can think of. This Psalm is only 5 verses long, you might want to give everyone in the group a chance to read the whole thing, or try reading it in a choral reading style (you read a verse and they repeat it back to you). Take a few minutes to talk about what truths this Psalm teaches us about God. 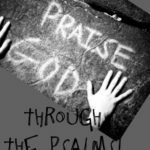 Have the kids point out the truths they see about God in the psalm…..He is God, He made us, He shepherds us, He is good, He is forever loving, He is faithful. As you go through the psalm looking at these truths about God, define each one and come up with examples from scripture where you see these attributes of God. Some will be simple, like He made us, or some like his faithfulness will have many examples.Ask the kids to tell you what the psalm says our reaction to God should be. Point out that it says that we should “shout for joy” and “worship the Lord with gladness” and sing “joyful songs.” Have kids notice that it doesn’t just say we should sing and shout to the Lord, but that we should be glad and joyful while doing it. Have kids demonstrate how you could sing joyfully and how you could sing without joy (or feeling).Divide the kids into 3 smaller groups and give groups 5 minutes to come up with a song or cheer based on one of the truths about God that we see in this psalm. If kids need an idea to get them started, you might want to suggest something like ( “The Bible tells us what God’s like, what God’s like, what God’s like. The Bible says that God is good. He is very good.”….. to the tune of “Mary had a little lamb.”). Give groups time to work and them have them sing their songs or do their cheers for the rest of the group. have to give a clear answer the best we can. We just started a study in Psalms but it is not following the chapters of Psalms consecutively. I am going to use the coloring book for Psalm 1 but next week skips to Psalm 78. Is there a lesson geared to that chapter. Your material has been so helpful to me. So often I need activities for pre-readers and I usually can find just what I need on your site. Thanks for what you do and God bless you for your outreach. Thanks for all these materials. God will continue to expand his ministry in our hands and reward you bountifully in Jesus name.